The Wichman Clinical Teaching and Assessment Center (CTAC) was founded in 2004. The center’s state of the art design provides a simulated clinical environment which duplicates the real world as closely as possible. Working with medical school faculty and faculty from health care based academic departments, we focus on creating an environment that is conducive for learning and providing the teaching and assessment encounters needed for learners of all levels to acquire and demonstrate the skills they will need as learners. The facility has 24 clinical rooms in which health sciences learners practice and are tested on interviewing and physical examination skills. 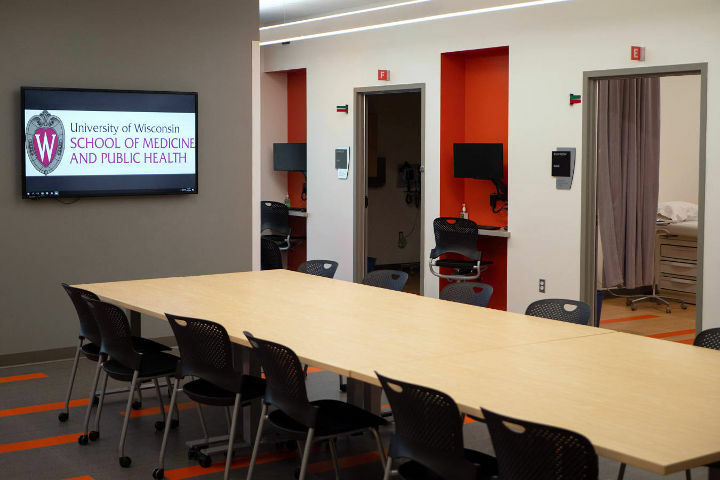 These rooms are equipped with ceiling-mounted video cameras and microphones that allow digital capture of learners’ encounters with standardized patients and faculty. All of the CTAC rooms simulate a standard clinical examination room and contain medical equipment, including otoscopes, opthalmoscopes, blood pressure cuffs, examination tables and sinks. Each room can accommodate four to six individuals comfortably for group sessions. The CTAC’s exam rooms, pictured above, and the Standardized Patient Program serve as learning mechanisms for UW School of Medicine and Public Health students, including students from the MD, physician’s assistant, physical therapy and genetic counseling programs. The CTAC is also available for use by health professions schools across the UW-Madison campus. Any group interested in teaching or assessment simulations with students, patients, clients can use the CTAC and the standardized patients. The CTAC staff will work with you to ensure that cases and the learner experience meets your expectations. On a case by case basis, the rooms and standardized patients are also available for marketing or other educational filming purposes. All events, CTAC room reservations, and reason for use of the standardized patients must be approved by CTAC staff. Fee assessments may be applicable to events and standardized patient use requested by University of Wisconsin departments external to the UW School of Medicine and Public Health or other outside users. You will be notified of fees and provided an estimate upon submission of your request. The CTAC is open for students with approved access 24/7 for independent study and the video-captured sessions can also be viewed from any location with approved access. Normal hours are from Monday through Friday from 8 a.m. to 5 p.m. Off hours facility use and use of standardized patients must be approved in advance. Please contact Andrea Maser: maser@wisc.edu or 608-263-6018. The CTAC is also equipped with conference rooms to provide learning areas directly adjacent to exam rooms. The CTAC is located in the Health Sciences Learning Center, 750 Highland Avenue in Madison. The Health Sciences Learning Center is located at the corner of Highland Avenue and Observatory Drive, just across Observatory Drive from the UW Hospital parking garage. The building has a skywalk attached to the front of it. Once inside the Health Sciences Learning Center, look for the elevators and take them to the third floor. Look for Room 3207 – the Wichman Clinical Teaching and Assessment Center. Staff are available to schedule standardized patients, as needed, for clinical teaching and assessment activities at the center. The Standardized Patient program began in 1994 and is an integral part of the CTAC. A standardized patient is a person who is instructed to portray an actual patient in a realistic manner to teach and assess clinical skills across all learner levels. 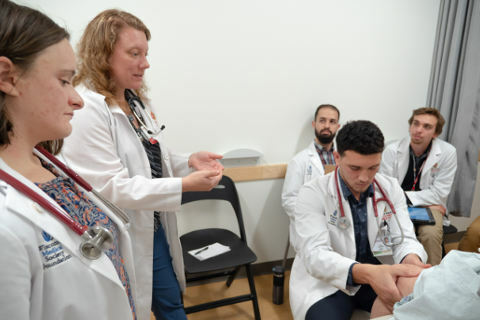 During interactions with a learner, the standardized patient role-plays a script and/or uses their own medical history to achieve the desired learning outcome(s) by the student and, in some cases, undergoes specific physical examinations as well. Each standardized patient encounter is designed to teach or assess skills appropriate to the student’s level of training. The word "standardized" means that the standardized patient repeats his or her story in a consistent manner to numerous students to ensure an equitable learning and testing environment for each student.